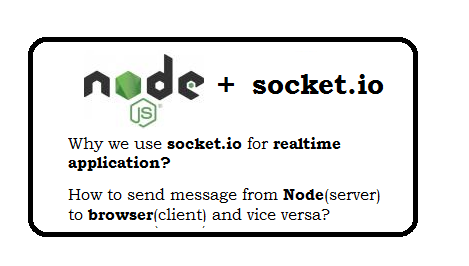 Question: What is socket.io module? It enables realtime, bi-directional communication between web clients and servers. a) client-side library that runs in the browser. b) server side that run in browser. Question: Give example of real time application? Instant messengers like facebook notification/message. Push Notifications like when someone tags you in a picture on facebook, you receive an instant notification. Collaboration applications like multiple user editing same file. Question: Why we use socket.io? bi-directional communication channel between a client and a server. When an event occur, socket get notify and let to know the single client OR all clients. It is trust application and used by Microsoft Office, Yammer, Zendesk, Trello, and numerous other organizations. Question: How to install socket.io in Web and Server? Question: How get to know, if user is connect/disconnect? Question: How to get to know, when new user comes in browse? Question: How to send message from Client(Browser) to Server(Node)? Question: How to send message from Server(Node) to Client(Browser)? Question: How to join the room and send message? Question: How to send message the room? Async module with NodeJs tutorial. request module with nodeJs tutorial. mocha module with nodeJs tutorial. Node js Redis tutorial - Quick Start. How to Create RESTful APIs in Node Js using Express JS and MongoDB. Mongoose Tutorial - listing records, Add Record, update record and delete record. What is mongoose? How to use mongoose with nodejs for mongodb?. Angularjs 2 Interview Questions and Answers. Node js Tutorial for beginners with examples - page 5.